Hardcover (August 1992) Used item. 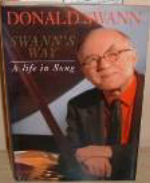 Donald Swann was half of the internationally-known partnership with Michael Flanders which featured in the long-running shows, "At the Drop of a Hat" and "At the Drop of Another Hat". This is story of Swann's life, with emphasis on the "Flanders and Swann" years. It outlines his prolific professional life working with, among others, Joyce Grenfell, Sandy Wilson, Sydney Carter and John Betjeman. He tells of the influence of his Russian parentage, his school days at Westminster and his growing pacifism. The book aims to reveal, with a blend of merriment, lyricism and philosophical questing, Swann's guises as a composer, performer and deeply spiritual man.